Century Cycles Blog: Have You Checked Your Chain Lately? When you bring your bicycle into the shop for service, you may notice that we try to seat a small metal tool onto your chain. What we're doing is measuring the amount of wear in your bicycle's chain--and (indirectly) the wear on the cogs and chainrings. Over time, as you ride your bicycle, the chain rollers and pins slowly wear down. As they wear, the chain actually gets a little bit longer, mainly because the holes in the rollers get ground open (bigger hole) and the pins get ground away (smaller pin). The rollers can be pulled apart further under tension because the metal is worn away. Cyclists often call this wear "chain stretch". The downside is that as the chain wears and elongates, it slowly wears down the rear cogs, chainrings, and rear derailleur tension pulleys as well. In short, failing to replace a worn chain gets rather expensive. 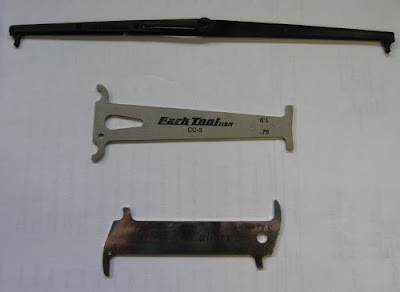 The bicycle tool companies have some really slick, cheap and easy to use gauges that measure how much chain wear is acceptable, and when it's time to start anew. Here are three "chain checkers" as we call them. Top is a $10 Wipperman model, middle is the $12 Park Tool and bottom is a $38 Rohloff. I personally don't care for the flexy plastic Wipperman, so let's forget about it. The Rohloff is very nice, but about 3X the cost of the Park tool and isn't demonstrably any better. Winner is: Park CC-3 in a landslide financial decision. very similar and by far the easiest ones to use. Hook one end of the tool into any chain roller and try to seat the opposite end into the chain. The tool basically pushes the rollers apart to see how far they separate. If the tool will not go in at all, Perfect! Hooray! All is well in your chain's world. Now get out there and ride! If the tool will drop in on the .75% marking, it's time for just a new chain. Congrat's! You've ridden some miles and caught the wear at the ideal moment in time. If the tool drops on the 1% mark, things are going to cost some money. The chain and cassette are goners. Drivetrain parts need to be replaced as sets. A new chain alone will not seat properly on worn rear cogs. The chain will skip out of gear under load (think "big hill") and no amount of adjustment can put the metal back on the cogs. Not all the parts need to be replaced if the wear measures at approx 1%. The chainrings up front live longer lives than rear cogs by virtue of their larger size and the fact that the chain wraps around more of the ring's circumference compared to the rear cog wrap. A bigger ring spreads the load over more teeth, thus less wear. About 1/3 of the total teeth on a rear cog engage the chain. That 15 tooth cog you ride the most? Gee, maybe 5 teeth holding. That 1% of wear didn't sound like much to me either. That's why it matters. Keep the chain clean. Lube it often. Get--and use--a chain cleaner. The cleaners work incredibly well. All the drivetrain parts last longer if you clean the road or trail grime from the chain. It'll shift better, too. Finally add that $12 Park Tool chain checker to your tool arsenal. Try to drop it into your chain every month. It'll take you more time to find it than to use it. Replace the chain as soon as the .75% wear mark drops in. Used monthly, you can replace the chain several times before you need to replace the rear cassette gears. It's typical for a chain to last about 2,500 miles before it needs replaced. It'll go longer if kept clean and lubed. Lighter riders get more mileage, too. (Lucky!) Finally, keep in mind that there's some significant money to be saved with such a cheap tool. Last time I checked, those 9 and 10 speed cassettes weren't getting any cheaper. Surely I mentioned that the bike just plain works better when all the parts are within spec? And that's why you really use the tool.